I guess I must have had a quilting hangover last week, cause I totally missed our party. Actually nothing really quilting related happened because I was too busy real life-ing...sometimes that's the pits. But I'm quilting sober now and all ready to go! Operation #SlashThatStash is back in swing! Though it's been more sorting and pressing than actual slashing. 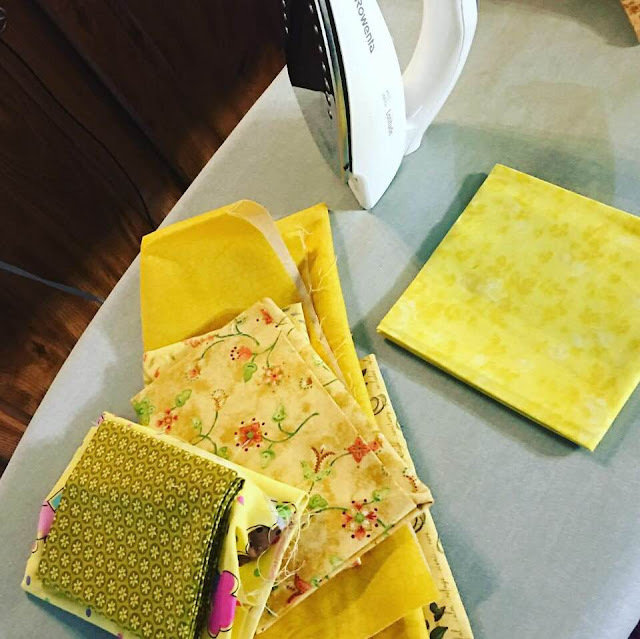 I have pulled out the small yellow tote of fabric to work on with the browns and it hit me...do something cool with your fat quarters! So I pulled all the green, yellow and brown fat quarters, unfolded them from what ever form of folding they were in and pressed them. I then folded them uniformly and began storing them in this thrift store shelving unit my mom got me for Christmas last year. I LOVE it! I can't wait for all of the fat quarters to start living here. Remember my stack of basted quilts? Well I have finally started quilting on one of them. I pulled out some spools of Aurifil thread and let the threads and quilt top speak to me. Overwhelmingly they all yelled radiating lines! I have to say I agree with them. My plan is to take a walk around the quilt top with my walking foot, then break into some free motion quilting in all the fun fire bursts. I better get my act in gear...I still have four more of these quilts to quilt. Now let's see what fun stuff you had for the last UFO party. 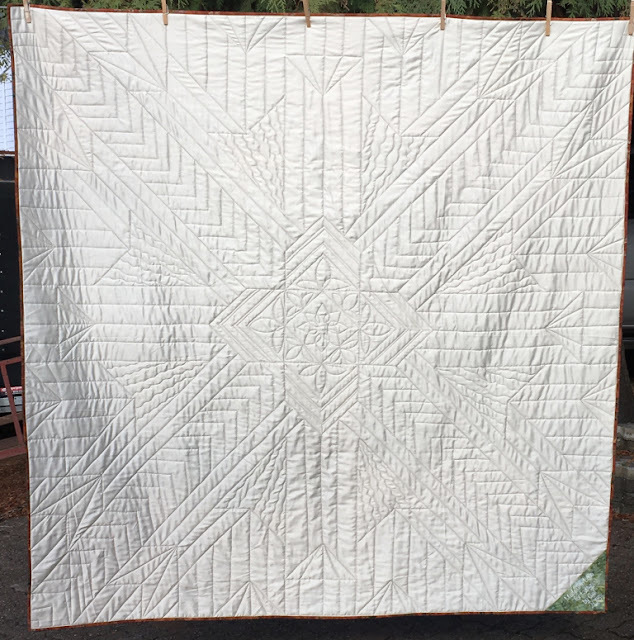 This week I am highlighting/celebrating some awesome quilting finishes. First up we have Gail at Quilting Gail and her Fireburst Mystery Quilt finish. I know, I know. I'm a bit biased when it comes to this quilt since it is the pattern brain child of myself and Dave the Quilt Engineer....but just look at that quilting! Gail did a fantastic job quilting this piece. If you haven't seen the front you need to get over there now and check it out. 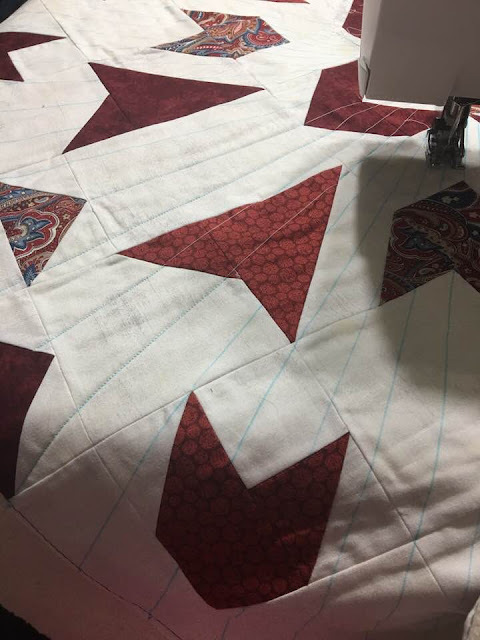 Next up we have my dear friend Sandra at mmm!quilts and her finish of Cindy at Stitchin at Home's pattern Outside Stars. Sandra calls hers Fallen Sky and it was her Island Batik challenge for the month of October. I'm not going to lie, the quilting on this quilt left me all hot and bothered. WoooWeee! Sandra did an amazing job quilting this one. All that yummy dot to dot quilting and creating ghost squares when there were none. It completely changes the look of the quilt. 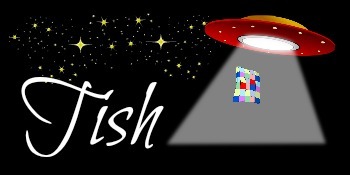 Get on over to her page and check out her quilting. I'll warn you, a quilting cold shower will be needed afterward...just saying. Orgasmic quilting...can I say that? 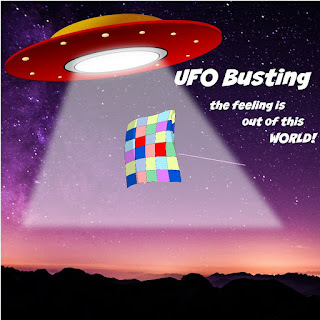 I would also like to highlight/talk about Jan at The Colorful Fabriholic's post on saying goodbye to UFO's. Sometimes you have to evaluate the quilt tops you have on hand and have a heart to heart with yourself. That's just what it sounds like Jan did. She did the most amazing thing, and contacted Sarah at Confessions of a Fabric Addict about sending her some UFO quilt tops for Sarah to finish for her quilt ministry. Sarah does an amazing job sending out quilts to those in need. Please stop by and visit both ladies to read about this story and Sarah's work. Now let's see what you've been up to this week. Link up below and tell us what has your quilty heart going pitter patter. I will leave you with a quilt that has haunted me for years. Every so often someone tags me in a picture of this quilt or sends it to me in messenger saying I should make it. I never have. It's called Labyrinth Walk. I discovered while going through my magazines, I actually own the pattern. Who knew? So this week I decided to take advantage of a sad yet major sale happening at my local quilt shop. Unfortunately she has made the decision to close up shop, but right now all her fabric is priced to sell. I knew that the bolts where thinned out and majorly picked from. Luckily, I was able to find a light, medium and dark blue that I thought would work perfectly. So for my peeps of Facebook, you asked and eventually you will receive...I am making the most requested quilt ever. I think it might be fun to donate it to my daughter's archery team as a raffle quilt next year. Momma needs to get to work! Your fat quarter folding is looking fabulous! That labyrinth quilt tempts me, too! I'm sad to hear about your local quilt store having to make the tough choice to close. Oh I just LOVE that quilt, and have ogled it for some time now on Pinterest. 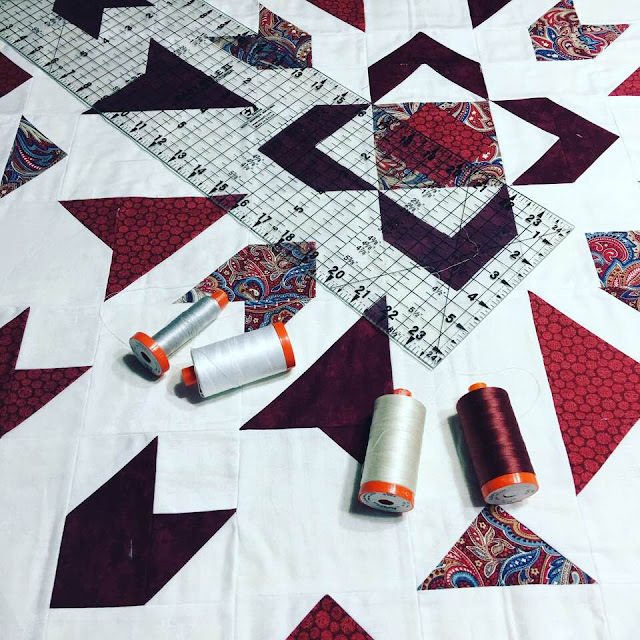 (We will talk my friend...) Thank you so much for the feature... orgasmic quilting - grin! Well, with friends egging you on, how can you refuse! And when bolts offer themselves up at a discount, you are doubly cursed, blessed? Your top is going to be interesting with those radiating lines, can't wait to see it done. 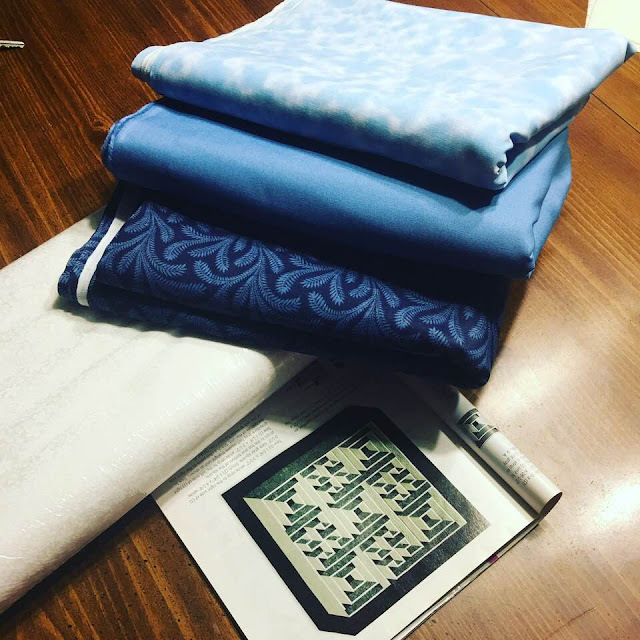 I recently did the same thing with my fat quarters-they were all shapes and sizes. Wonder who figures out all the fancy shaped folds for quilt shops? Whatever you make using the dark blue with swirly feathers has to be gorgeous-the fabric sure is! Mind if I ask the manufacturer? Great job putting up your fat quarters and sticking with your personal challenge to gain control over your stash. I just don’t seem to have the patience, so instead, I just decided to pull out a basket of scraps and make something, one basket at a time. Of course, that just generates more scraps, but then they are more manageable and take up less space. Your little quilt will be beautiful all quilted up. I have to clean up my stash and put it away properly. I like the idea of radiating lines. I might borrow that for one of my quilts. I wish there was a small size of that Labyrinth quilt. I'd love to make it too, but it's king size. Yikes! Too big for boat quilting. One of the women in our quilt group made a Labyrinth quilt, and it is so cool. It's on my bucket list to make for my son when he gets a place of his own. I want to just sit and look at those yummy yellow fabrics! Great idea on the fat quarter storage. My scrap slashing is on hold. I still haven't emptied the basket next to my sewing table! I need to remember to do a bit each day and work that into my sewing routine. I've been a little distracted sewing tomten lately. Haha! You certainly have been busy behind the scenes, Tish! Fun to see what you are working on, and how you are quilting Fireburst. I'm still pondering. I love that it looks complicated but is pretty easy. Can't wait to see how yours turns out! Hi Tish: I hope things settle down for you and that you are no longer dealing with things that are the pits. I'm rooting for you. Sorry I haven't been checking in as often as I should. I'm still working on your quilt along...almost all done the top. Have fun basting and sorting. 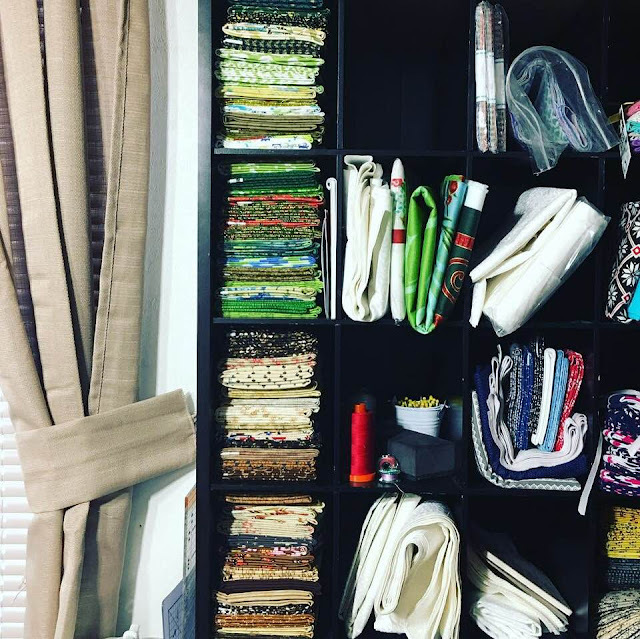 Your quilting looks beautiful and I have fallen in love with your shelf. It will be fun to see it filled with fabrics! Sandra's quilt is to die for! Thanks for sharing it with us! 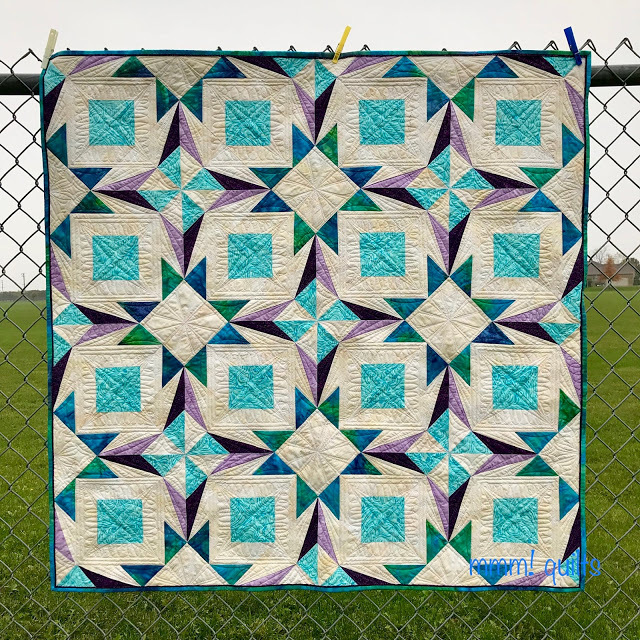 I love how you feature other quilters' work. It's so inspiring. Be careful with Labyrinth Walk. I've heard these is a mistake in pattern as it was published in the magazine. I don't know what it is, but you may want to google it. It IS a very cool quilt.